Brunswick Forest offers a beautiful outdoor setting and wonderful recreations at Hammock Lake. Brunswick Forest is set in Leland, North Carolina, just five miles south of historic Wilmington and 30 minutes from Atlantic Ocean beaches. The community opened in 2007 and features scenic grounds spread across 4,500 wooded acres. Interested homebuyers can currently choose from available resale and new construction homes. 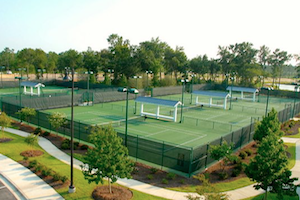 At the heart of Brunswick Forest, residents can stay in shape at the Fitness & Wellness Center. This 18,000 square-foot facility offers a state-of-the-art fitness center with cardiovascular and strength-training equipment, an aerobics studio, an indoor lap pool, locker rooms and a steam room. Outdoors, the amenities continue with a resort-style swimming pool and five tennis courts. Resident golfers can perfect their game at Brunswick Forest's Cape Fear National Golf Course. This public golf club offers an 18-hole championship course, as well as a 7,000 square-foot clubhouse with indoor and outdoor dining, locker rooms and a golf pro shop. Outdoor recreations at Brunswick Forest include tennis courts, a swimming pool, golf course, lakes and more. Beyond fitness and golf, Brunswick Forest brings residents together with social amenities. The Community Commons is a unique glass-enclosed clubhouse which offers a fireplace lounge area, a demonstration kitchen and an outdoor patio. The River Club lets residents enjoy a fishing pier, as well as a small boat launch for taking kayaks, canoes and rowboats out on the Cape Fear River and Intracoastal Waterway. The grounds also feature walking and biking trails, picnic areas and a picturesque gazebo. When it comes to homes, Brunswick Forest features townhomes, cottages and single-family homes designed by multiple builders. These diverse homes are spread throughout Brunswick Forest's twelve neighborhoods, offering options that appeal to many different homebuyers. Low-maintenance townhomes, featuring first-floor master bedrooms suites, are available in sizes ranging from 1,133 to 2,254 square feet. Homebuyers can also choose from a wide range of single-family homes which offer main-level living. These homes range in size from 1,011 to 3,402 square feet and they include everything from cozy cottages to spacious single-family estates. 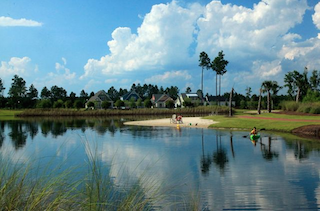 For active adults in Coastal North Carolina, Brunswick Forest offers easy access to sunny beaches, as well as nearby shops, restaurants and other entertainment. Its scenic grounds and on-site amenities create an ideal retreat for active retirees.